One youth has been convicted of murder and three others of manslaughter over the killing of a woman at a christening party as she held her baby niece. 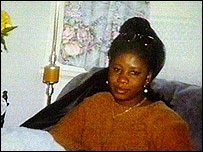 The victim had fled civil war in Sierra Leone only to meet her death on an estate in south London. Adama's parents will never forget the day of her christening. Alfred Sesay and his partner, Zainab, had hired out a community centre on the Acorn estate in Peckham, south London, on the night of 27 August 2005. They wanted to hold a party to celebrate their daughter's baptism and had invited about 100 friends and relatives, many of them - like the Sesays - from Sierra Leone or other west African countries. 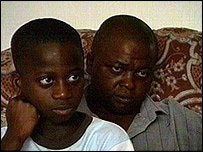 At about 2200 BST Adama's mother went to the toilet, leaving her daughter with the child's aunt, Zainab Kalokoh. Seconds later four youths, wearing balaclavas and brandishing guns and knives, entered the hall through the fire exit, which had been left open because it was such a warm night. The gang, intent on robbing the guests of their valuables, fired wildly into the air and one of them fired a shot at the head of Mrs Kalokoh. She collapsed onto the floor, mortally wounded, but she did not drop Adama and her body cushioned the blow as she fell. The child was covered in her aunt's blood, but unhurt. As partygoers fled the party in panic or cowered on the ground, the gang collected handbags, mobile phones, watches and jewellery and threw them into a binbag they had brought with them. But they had not bargained on pensioner Assie Munu. When one of them grabbed hold of the 70-year-old's handbag, she held on. After a brief tussle, he snatched it off her, but she grabbed hold of his jacket and held on as he fled through the fire exit and up some stairs. Finally he shook her off and vanished into the darkness. Brian Altman, prosecuting, said: "Mrs Kalokoh had come to this country to flee war-torn Sierra Leone, her homeland, doubtless in the reasonable expectation that this country would provide her family and her with a peaceful, violence-free life. She was tragically wrong." "She cared for everybody around her. She was a very good lady. She took care of people. She loved people." Mr Altman said she was targeted while attending a party on the "squalid" Acorn estate. Mrs Kalokoh, a healthcare worker and mother-of-two, lived in Stratford, east London and was separated from her husband, Alieu Kargbo. He said: "She came here because of the war in Sierra Leone, because she wanted a better life. A series of 999 calls brought a fleet of ambulances and police cars to the Acorn estate but paramedics were unable to save Mrs Kalokoh's life. Police set up a cordon around the murder scene and it was not long before the defendants began to raise the suspicions of uniformed officers manning the cordon. One of the defendants hurled abuse at an officer and said: "I'm gonna pop you!" after he refused to let him cross the cordon. The following day two of the defendants, brothers Timy and Diamond Babamuboni, who lived on the estate, were arrested by police. Later that evening police began a meticulous search of the flat. They found seven 9mm gun cartridges in the pocket of a jacket hanging up in the hallway. But even more significantly they found the binbag, secreted behind a wall unit, which contained the stolen handbags. Among the items inside it were a handbag, keys and a mobile phone which had been stolen from Adama's older sister, Kadie. Four youths were eventually charged with Mrs Kalokoh's murder. Three were convicted of manslaughter and the fourth was found guilty of murder. The youth who is thought to have fired the fatal shot, owed £5,000 - a drug debt - to a member of the notorious Peckham Boys gang known as Mad Larry. During the trial the jury was shown footage - taken on a mobile phone - of one of the killers pointing the shotgun at a terrified youth who was forced to strip to his underpants as his tormentors laughed. A key prosecution witness, E, told the trial he was friends with the defendants and had been at one of their flats at the time of the shooting. He said they returned at about 2300 BST and began exchanging recriminations. 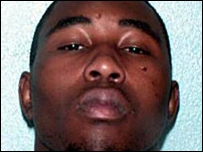 In the witness box E said: "They were arguing about someone who had got shot and who had shot the woman or something. "One was saying it could not have been the shotgun as it would have caused much more damage. The other was saying it was not him." E also explained why the party had been targeted: "Most of us had all been to some African parties in our upbringing. The men spend to show they have a lot of money - showing off their jewellery. That's the reason we were going there. We would take it." 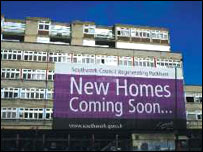 In 2000 Southwark Council voted to demolish all 317 homes on the estate, a decision which was backed by the residents. The estate is now empty, and cordoned off with a heavy duty security fence, and the wreckers are about to move in and demolish it. The council hopes it will help to erase the murder of a woman who came to Britain seeking sanctuary.